SAN DIEGO, Calif. /California Newswire/ — San Diego-based MCT Trading, Inc., a recognized industry leader in mortgage risk management providing pipeline hedging, best-execution loan sales and centralized lock desk services, announced that its COO, Phil Rasori, was named one of the Top 40 Most Influential Mortgage Professionals Under 40 by National Mortgage Professional magazine. Rasori earned a spot on the list largely for his lead role in architecting and launching MCTlive!. "What Phil accomplished with MCTlive! is extremely impressive and we are elated that National Mortgage Professional magazine honored him," commented Curtis Richins, president of MCT. "His forward-thinking and innovative approach to the development of MCTlive! demonstrates that he is indeed a rare talent in the capital markets space. 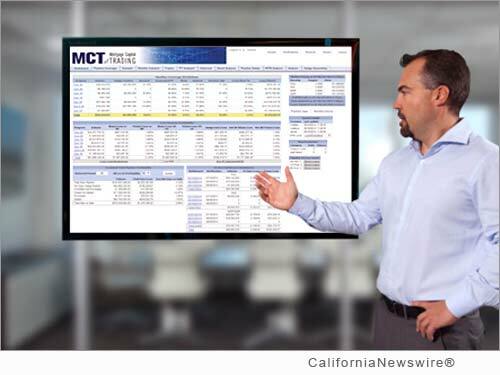 Since the official launch of MCTlive!, it has been well-received by our clients and is exceeding our expectation for adoption with new clients." Notable is that Mr. Rasori's diligent work with MCTlive! (TM) won the company Mortgage Technology magazine's coveted 2014 Release of the Year Award. The award recognizes a new software, platform, alliance or initiative that's expected to have the broadest future impact on the mortgage industry. He is also responsible for designing MCT's proprietary pipeline hedging and loan sale program — HALO — which combines market-proven pipeline hedging disciplines with best-execution negotiated loan sales services. HALO has helped over 200 lenders effectively manage risk and achieve greater profitability. For more information, please visit http://www.mct-trading.com/ .